Background: After a successful high school campaign (100 yards and 220 yards) during which I set the school 100 yard record (9.9), I had a fairly uneventful college campaign—one season at Rutgers. I took up road running in the 70s and ran in my first post college track event in 1982—a 100 meter race at a Los Gatos (CA) summer all-comers meet. I competed in several masters meets in the 80s. In 1987, my family and I moved to the Netherlands. There I had the opportunity to train with a top Dutch club PSV Atletiek for two years. I actually held the club masters 100M record for a while. Back in the U.S. in ’89, I picked up where I left off—all-comer meets and masters meets when and where I could. When I’m not competing, I handle public relations for a major software company and enjoy honing my cooking skills preparing Italian cuisine. 2006 – Hayward Classic 100M 1st place; Pacific Association Masters 100M 1st place; Club West Masters 50 meters, 100 meters, 200 meters, Long Jump 1st place. 2007 – Hayward Classic 100 meters and Long Jump 1st place; Pacific Association Masters 100 meters, 200 meters 1st place; Club West Masters 50, 100, and 200 meters, Long Jump 1st place. 2008 – U.S. Indoor Nationals 60 meters – 3rd place; U.S. Outdoor Nationals 100 meters – 3rd place. 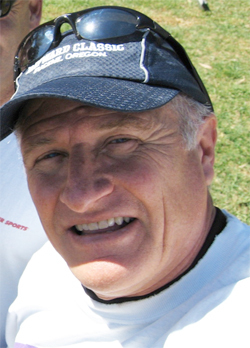 2010 – Pacific Association Masters 100 meters – 1st place; U.S. Outdoor Nationals 100 meters – 4th place.